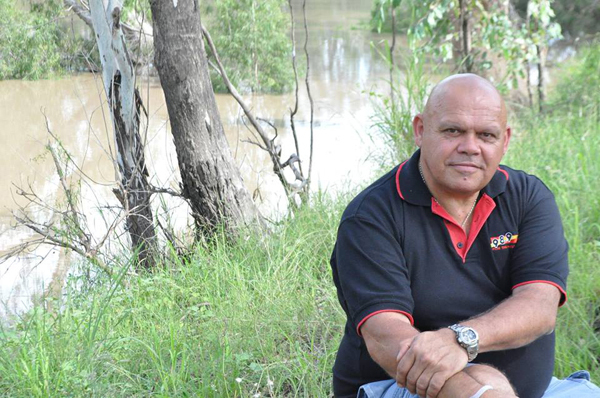 Australia’s most prominent First Nations broadcaster, Brisbane-based Tiga Bayles, has passed away early this morning. Following is a statement issued by the Brisbane Indigenous Media Association on behalf of his family. It is with great sadness that we announce the passing of Tiga Bayles, a Birri Gubba Gungalu man and a Dawson River Murri, who died early this morning after a long battle with cancer. Tiga Bayles – the Chief Executive Officer of the Brisbane Indigenous Media Association’s 98.9FM radio station – was aged 62. Tiga was born Harold James Phillip Bayles on 6th October 1953. He was raised in Theodore in Central Queensland, and lived in Redfern, Dubbo, Coonamble and later Brisbane. He was a leading figure in the Aboriginal rights movement, and played a key role in the 1982 Brisbane Commonwealth Games protests, and protests at the Bicentennial celebrations in Sydney in 1988. Tiga was an early chairman of the NSW Aboriginal Land Council, and named Queensland Father of the Year in 2005. He raised nine girls, and was Australia’s most prominent – and awarded – First Nations broadcaster. Among his many honors, Tiga was the inaugural winner of the national Deadly Award for Indigenous Broadcaster of the Year, and his work around decolonisation and invasion was recognised by Amnesty International’s inaugural media awards in 2014. Tiga served on numerous boards, including the National Indigenous Radio Service, a community-controlled organisation he helped found. He was also the Asia Pacific representative of the World Association of Community Radio Broadcasting, a role that saw him travel the world advocating for First Nations’ media. Tiga was deeply involved in the renowned Murri School in Brisbane’s Acacia Ridge, and served as its Chairman for many years, a role he held until his passing. He got his start in the music industry touring the country as a band manager with Murri Jama. Shortly after, Tiga helped to establish Radio Redfern in Sydney with his mother, Maureen Watson. Tiga eventually moved back to Brisbane, and helped establish the Brisbane Indigenous Media Association, and the National Indigenous Radio Service. BIMA – the home of 98.9FM – is one of the nation’s most popular and successful community radio stations. Tiga’s morning program, Let’s Talk, was broadcast five days a week around the nation via the National Indigenous Radio Service network. Tiga’s family, under the guidance of his uncle Ross Watson, created BIMA. Tiga took the reigns when Ross retired, and oversaw its expansion to become a nationally recognised training organisation for First Nations people working in the media. More than a thousand First Nations people have been trained in broadcasting through BIMA, via an innovative school-based traineeship program. Tiga led the move of 98.9FM to a state of the art multi-media centre in West End in 2011, securing the future of First Nations media for generations to come. Tiga passed away peacefully at his Brisbane home early this morning, surrounded by family and friends.